My prayer is for the future of publishing: Let the earth’s resources be used resourcefully. Let the art be above the bottom line. Let books be more than just pictures and fonts (and let those be choosen with care). Let the design take full use of the form. Let the books we lug be the books we love. We’ve been fools worrying about the end of books, when there was no need to worry--it was already over. We fretted so much over the emperor’s new clothes, we didn’t notice he’s dead. The book died awhile ago; Print-On-Demand (POD) rolled the boulder over his grave. Now it’s up to the Kindle to resurrect. 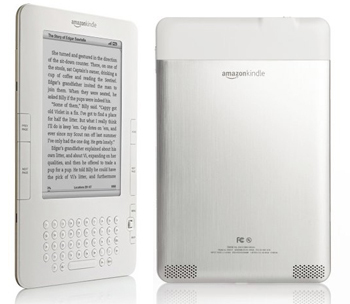 The Kindle is not the replacement for the book, it’s a new device that can rid us of these uninspired shells. Books are being manufactured for profit, not concept--sin is a prophet without vision. Why print something if the printing doesn’t mean anything? Why own ugly books if you’re not even going to read them? Kindle that crap out of existence. Give us the book’s real innovation: beauty from combining phenomenon and noumenon, the art of the hands and the art of the mind. Small, struggling presses who care about the tree’s sacrifice, who want the pulp to match the ink, who want design to enhance the text, they are the great hope of the printed word. Let the romance shelves at the grocery store fade away. Give printers here a reason to produce quality, not quantity. The bookshelf should look like an art collection and not an unrequited reading list. Jeff, remember a book is a physiological creation, just like people. The ideas should be enhanced by the design. Use the beauty of type and true book design for your screen, Kindle, and you’ll conquer us, the Aristocrat Readers. Now because we are all to blame for anything which suffers a lack of dreams, I’ll load my jaw with ammo and fire these thoughts at the Kindle in the name of Guttenberg, Linnnaeus, and William Blake. Size. Thin is only a by-product of the real issue: portability. The Kindle 2 may even be too thin--I often worry it’s going to snap in my bag. The screen should fold or roll up. Pocket Size is the key. And if the keyboard could fold under or even detach, Kindle would be more mobile. Pockets that’s where things are carried. Joystick. You picked the wrong 80’s arcade tech to revive. People like smooth motions, no stop and go. Think Scrolling. Once a scroll was an object written on, but now it's a motion. More verbs and less nouns please. People want a touch screen; you want to make it affordable. Until both are possible: Scroll. Battery Life. The two-week battery life amazes me, but who’s that for? Who's away from an outlet for that long? Campers and hikers? Is that really the market? More speed, memory, and less girth, then just two days of battery life would still amaze me. Screensaver. Give the people control. Keyboard. The internet taught us that readers should be writers, which is why everyone has a blog and an opinion. A full-sized external keyboard should plug into this. Fill the market for a truly portable writing device. Not only could students, business men, renegade poets, dictators, monks read on the Kindle, but they could write on it as well. The Kindle should be more of a verb (for historical precedent, see the word "scroll"). Poetry. What you got against poesy, Mr. Bezos? Why no poetry section on Amazon? Why this horrible lack of control over line breaks on the Kindle? This is a travesty. Careful, Mister, or they’ll hang an albatross around your flightless neck. The poets, hopped up on cigarettes and madness, are watching you with a quill in each angst-strong hand. Games. Newspapers are trying to keep their crosswords purely to encourage more people to buy paper editions. Destroy them. Give the Kindle crosswords and Sudoku. Tell Will Shortz to do a Kindle edition. Something more than the Minesweeper egg (I am a fan of the game). Web. Surfing the web requires a faster screen. A detachable lcd screen that would eat up more battery life but allow quicker navigation would do fine. Speakers. Lose them. They only take up space. Ipods don’t have built in speakers. Headphones jacks are enough. Pages. Kindle pages should be marked where the physical page begins and ends--a feature turned on or off depending on the user’s preference--then documents can be used in, say, business situations where non-tech geeks have printed pages and the other geeks have the Kindle (the same idea would also apply to well-planned Breakfast Club scenarios). Stocks. In this failing economy, people shouldn’t be flailing around trying to find out how much money they’ve lost. Tell them right away. Google’s stock ticker is better. Why not allow us to buy low and sell high? Why not be a part of that? hmmm? Music. If Kindle can play music, why can’t it download music? Slap some upgradable memory on that bad boy and let the good times roll (laissez les bons temps rouler for Louisianans). Amazon is a major player in music sales--especially in Britain--when you finally get to sale these overseas, don’t you want them fully capable? Ask yourself What Would John Lennon Do? Datebook/Calculator. Add a calc and d-book. An alarm would be nice--a silent warning--so the reader can set how much time to read/browse while waiting for loved ones to finish shopping. PDFs. I hear there’s already a hack for this. It should just be a standard option to read PDFs on the Kindle. Google Books. Kindle should be able to access the new Google books and download them. 1.5 million books and professionally rendered for PDAs. It should be more than just a web accessible site. This should incorporate into the Kindle. Purchasing Books. If I buy a book through Amazon, why do I need to re-buy it if I want it on Kindle--either there should be a small fee to do both or the physical version should include the electronic text. Organization. The Kindle’s “My Clippings” option is great, except its order is always chronological. I want to be able to order these by book too. Loss. Lose one book and you have to replace that book, but lose a Kindle and you’re out about $350 plus your notes and time. There needs to be a locater device on this thing.